Brianna Hai runs an occult shop that sells useless trinkets to tourists–and real magic supplies to witches and warlocks. The magical painting that hangs in Brianna’s apartment is the last portal between the fae and human worlds. A shocking magical assault on her home reveals to Brianna that her father, High King Liu of the Fae, is under attack. With the help of her gargoyle, Pug, her friend David, and Angelo, a police detective who doesn’t believe in magic, Brianna recovers what was stolen from her and becomes an unwilling potential heir to the throne. 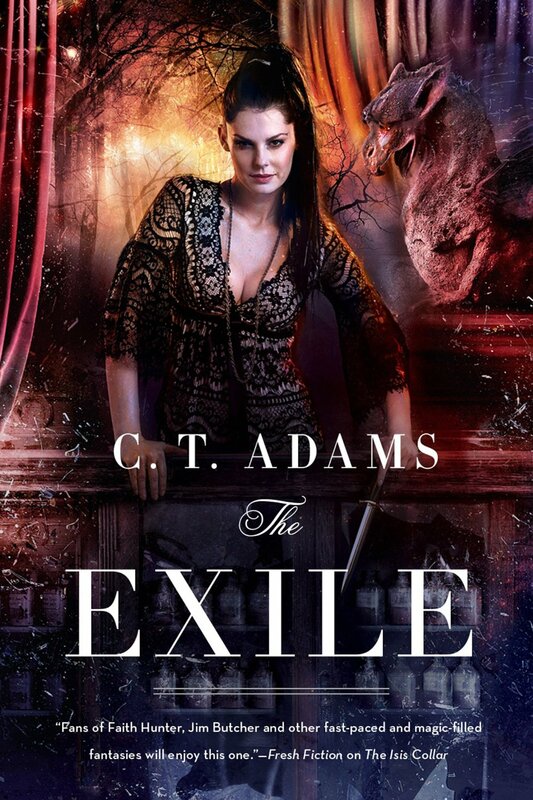 A suspenseful urban fantasy with a hint of romance, The Exile is the first solo novel by C. T. Adams, who is half of USA Today bestselling author Cat Adams. Like the Cat Adams Blood Singer novels, The Exile is set in a world where magic is real and contains Adams’s trademark blend of suspense, action, humor, and strongly emotional writing. The Exile is the first installment in an exciting new series by C.T. Adams! This will be the first solo release for the author, who happens to be one half of the bestselling writing duo Cat Adams! KEEP READING FOR MORE INFO ON THE BOOK! I have never read a Cat Adams book, but we used to have a reviewer on the PT team who LOVED the writing duo. So, when I saw that one half of the duo, C.T. Adams, had written her first solo book, I decided to give it a try. And I was not disappointed! I have no frame of reference for comparison, so I cant tell you if The Exile was anything like the writing style of Cat Adams, though. From a technicality front, The Exile was very well written. The story line was thought out in great detail and woven together perfectly. The main character is strong while still maintaining femininity. The supporting cast consists of many different characters who all have great personalities. With the exception of a minor hiccup in the beginning (which I will get into in a minute), the pacing is perfect. All around, the writing was tight. I was very impressed! The only thing I had trouble with was the start of the book felt a little choppy. That being said, I find that with a LOT of series first installments, to the point that I kind of expect it. First installments require a lot of world building for the readers. Once that world building is done, the story is free to just flow. I think in a lot of cases, that takes away from the story a bit, but I dont feel it did in this case. Even with the building of the background, C.T. Adams still managed to move the story forward at the same time. It just has a couple of rough spots at the beginning. Once the story really starts to flow, it takes right off. Overall, I felt The Exile was an excellent start to a new series! I am really looking forward to reading more of Brianna and seeing where the story takes her. The review copy of The Exile was supplied by Tor Books in exchange for a fair and honest review.